This place is definitely one of the most impressive places I have been so far in my life. The monasteries of Meteora thank their uniqueness to the combination of religion, culture, architecture and nature. In my opinion this combination results in a breath-taking, blissful and peaceful atmosphere in a way I have not experienced anywhere else so far. The many awards and recognitions the monasteries received are prove that not only I think this place is unique in an very impressive way. I can imagine you may not have high expectations of a Christian monastery if you’re not interested in the religion itself. However, I can tell that even Ben, who is very down to earth and has no interest in Christianity was very impressed by the atmosphere in this unique place. And even if you think you will not experience it in the same way as I did, the architecture combined with the impressive creatures of nature is reason enough to visit Meteora at some point of your life. There is so much I would love to share with you about this place that I could possible write a book about it. However, I will try to keep it short and give you an impression of how I experienced this daytrip. As the place has so much history (and I am a bit of a history nerd) I cannot help myself but share some of the impressive historical stories to. Not only are they of an historical interest, they also inspired me to become the better version of myself (something I am looking for every day). As I do not really know where and how to start with this blog, I just will start with how the trip to Meteora started. Before Ben and I moved from Greece to the Netherlands, we had planned two months for traveling through Greece only. You may think that would be enough, regarding to the fact that we already had seen so much of Greece. However, this didn’t seem to be the fact at all. The result was that we only had one day left to visit Meteora and we had to travel towards the monasteries with the night train. This was definitely not the experience I expected! The train station was in a part of Athens I wouldn’t normally go by night as it is known for its criminality. However I cheered myself up with a hot tea and the fact that I soon would finally see incredible Meteora. Once the train had arrived things didn’t really go as planned. Don’t get me wrong, the tickets were really cheap, but the website promoted more private seats, which we did not get, also the seats where really small, so it was hard to sit normally without touching your neighbours (how was I supposed to sleep in this place?!). Including the fact that the train was fully loaded, I just got my wallet back after it was stolen a few days before and there was a very odd smell in the train resulted in no sleep at all for Ben and me. Once we arrived at Kalampaka, the village that lies beneath the mountains of Meteora, it was still completely dark as it was before 05:00 in the morning. However, I did expect more cafés to be open, as I thought the place would be more touristic. Besides that, I experienced Greece as a country where the cities never sleeps. When I arrived at a completely dark village with no sign of life, I got a bit scared to be honest. After a night of no sleep, what where Ben and I suppose to do in the middle of the night when there was no place to go?! I couldn’t be more happy when we found that one coffee shop that was still open. And from this point, the day only got better. I ordered a hot tea and Ben some coffee, and while we were waiting for the right time to walk upwards a Greek man sitting a few tables in front of us started talking to us. He was really nice and after a few words he explained us he was a taxi driver and offered to bring us upstairs for the small amount €10,-. As we both where exhausted we immediately accepted the offer. The Taxi driver convinced us to go immediately (it was around 06:00 in the morning) so we could see the sunrise. Best tip ever! And I cannot give you any better advise! While driving uphill, we were impressed by the unique mountains, but the taxi driver told us “this is nothing, wait for it”. Meanwhile the taxi driver took some pictures of us and explained us a lot about the nature of the area and the history of the monastery. It was obvious that the men loved the place where he was born and raised and I couldn’t blame him for this. The taxi driver brought us to an incredible point of view where we could see several of the monasteries becoming one with the rock pillars and the sun coming up behind them. What makes the nature and the mountains of Meteora so unique are the unusual forms of the rocks rising up to the sky. These are not the kind of mountains you see on a daily basis, and I immediately wondered where they got their amazing looks from. This was probably the part where Ben got most excited about, as he is a real geology freak and he was more than happy to tell me about it. About 60 million year ago (which apparently isn’t long when talking about geology), series of earth movements pushed the seabed upwards which resulted in a high plateau. The huge pillars we can admire nowadays were created by erosion by water, wind and extreme temperatures. The water, but also sand, stone and mud flowed as streams into a lake that disappeared millions of years ago. Although this may already sound quite unusual, this actually happened in many other places on our beautiful planet. What makes Meteora so unique is the fact that all rocks look similar including only a few signs of vertical layering and the localised vertical erosion. 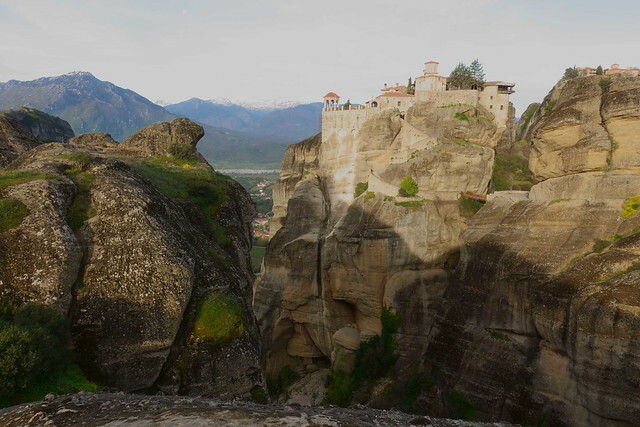 Beside its unusual geology, there are these typical Greek monasteries dominating, but on the same time becoming one with the nature on top of the rocks (how did they get there?!). Each monastery with its own unique but always brave history. We didn’t had enough time and energy to visit all of the monasteries, also I prefer to fully experience a place and not to rush my visit. The first monastery we visited was the Holy Monastery of the Great Meteoron, Also the starting point of the organized monastic life at Meteora. It is the oldest, largest and most formal of the extant Meteora (D.Z. Sofianos,2012). Saint Athanasios is the founder of the Meteorite, a men who didn’t like the all facilities the world had the offer neither the noise of the city. It was quite a walk upstairs to reach the beautiful monastery, but sure worth every step of it. I dressed myself up in one of the scarfs and immediately felt I stepped foot in an unique place. The first thing we saw was the fresco of the Last Judgement (1483). I have a special weakness for the byzantine frescos especially when they are old and the colours are a bit faded. It is the combination of the colourful paintings telling a story to the people who take the time to admire them. Peaceful as the area may seem, this definitely haven’t been the case in the history of the monasteries. And although the first frescos we saw in the monastery where telling the Biblical stories, walking into the chapels we also saw painting of the cruelty Christians had to undergo during times of oppression. There where painting of the first Christians who’s life had come to an crewel end by torturing in ways I didn’t even know about. Although these frescos where very hard to watch, it also made me respect and admire these Christians that keep spreading the worth of God knowing the risk they were taking. They must have been very sure and very aware about the importance of their message. After being impressed by these Frescos we walked into the museum of the Monastery. For every historical lover these museums are tiny heavens. The museum at most Greek Orthodox monastery are always very small but always have some real historical treasures to admire. Especially when you are interested to learn more about the byzantine empire and the role of Christianity during this time I can absolutely recommend you to spend some time here. “IN 1809 after the legentary papa Thymios Blachavas had been cruelly tortured to death by the monstrous Ali Paha at Ioannina, the Abbot Parthenios Orphides was held captive in the Epirote capital. He had been incarcetated in the Pasha’s dungeions obviously because the Great Meteoron Monastery, like all the other monasteries, had encouraged and supported the patrioctic movement of the firey priest. For this reason all the monasteries in Meteora suffered from the vengeful wrath of the heimos tyrant of Ioannina: The Pasha captured Papa-Thymios Vlachavas and sent him to Ioannina to Vizier and he cut him to pieces” (D.Z. Sofianos,2012). In the Year 1609 the monastery was looted by the Turks. It was completely devastated. 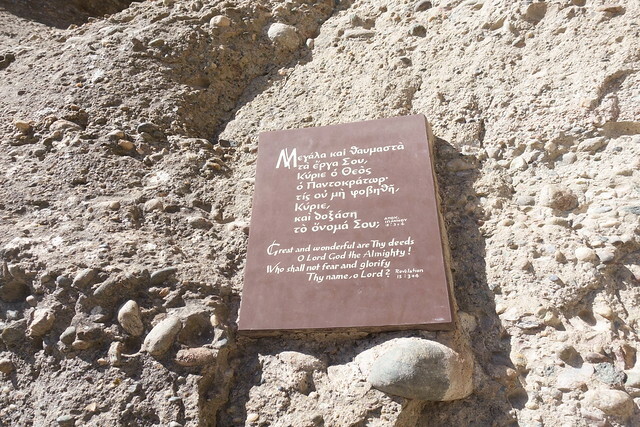 In1616 on Good Friday de Monastery was cruelly looted by the Pasha of Ioannina Arslan-Bei whoe “under the pretence of seeing the monastery together with his retinue, tricked the monks and as soon as they pulled him up, he and his soldiers started to shoot at them. He killed three or four of them and the looted everything (D.Z. Sofianos,2012)..
What I really want to add at this cruel part of history, is the fact that the monasteries have always had a very important role in protecting the Byzantine culture and the religion. During times of occupations, the monasteries where the place where the Greek people could hide and find a safe place. The location of the monasteries was perfect for this and made sure the monks as well as the byzantine residents had a safe place to stay for a very long time. This again is one of the things I have great respect for, and I want to use as an inspiration for my own life. After our visit to the Great Meteoron, Ben and I walked towards the St. Stephens Holy Monastery, which is situated on the southeast end of the area. This monastery is a nunnery since 1961. Though this monastery is smaller and not much history is registered, it is still very beautiful and owns another interesting museum beside the incredible chapels full of colourful frescos. 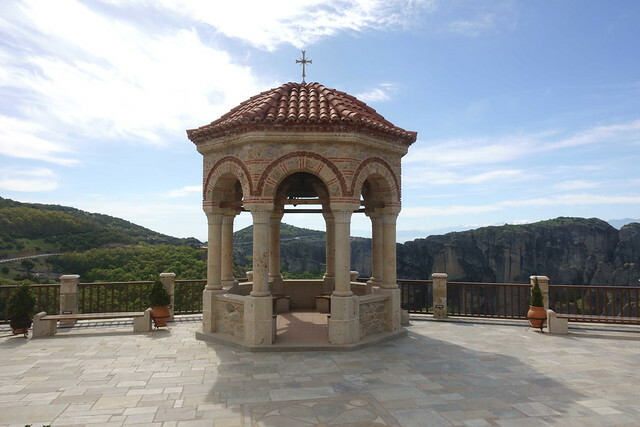 What I found very special was actually the outside of the monastery, where you could walk through the gardens and admire the impressive view underneath the gorgeous gazebo. The third and last monastery we visited was the Monastery of Varlaam, which we had to walk another exhausting stairs for. Don’t get me wrong, I like combining my traveling with some fitness and exercise. Also the views during our walk upstairs only got better. When visiting the Kathalikon ( the main church) Ben and I were discussing the meaning of the impressive Frescos, and luckily a very friendly monk was explaining about It to some visitors who asked about it, so we could also listen. I think all monastery have an unique combination of so many things (the nature, the blissful atmosphere, the friendly monks, the architecture, and so much more), I have only experienced this kind of combination and atmosphere at the monasteries of Meteora, and the visit is one of my most exceptional memories. After visiting three monasteries, it was time for us to walk downwards to Kalampaka, another exercise. I do not like to complain, but I am just telling you this so you are prepared: once we arrived at the village, my feet’s hurt like hell! I was so happy when we could finally sit down in the warming sun whit some cold water and delicious Greek food! 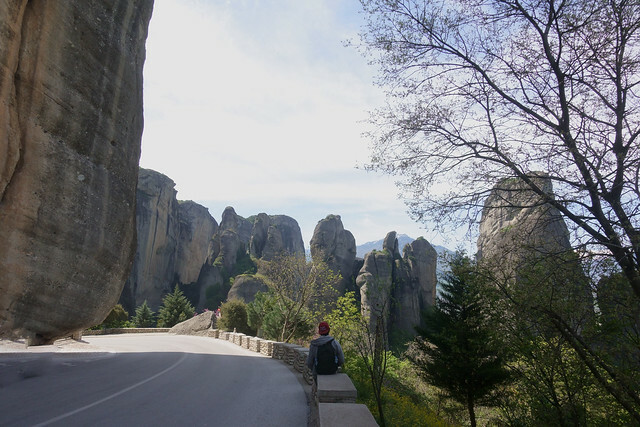 How to get to Meteora: There are several ways to travel to Meteora. Trains come and go from several big cities (Thesaloniki, Athens) and is very cheap to, but depending in the time traveling by train is not always very comfortable. You may rent a car, which gives you a lot of freedom. Also organized trips are offered from several bigger cities. You may find the website at the end of my blog. Food at Meteora: Before you enter most of the monasteries there are small foot trailers when you can buy yourself some easy food and something to drink. However, for a full meal you have to visit one of the villages lying beneath the Meteora rocks. Ben and I brought some food with us ourselves and had a very good Greek meal at the village Kalabaka. Here a restaurants will cost about €20,- (without alcoholic drinks), A cheap meal will cost about €10,- and a Gyros lunch will cost about €3,-. Sunrise our sunset at Meteora: Ben and I were lucky enough the see the sunrise on one of the impressive Meteora rocks. As it was still early, it was still very quiet and peaceful. As I am a morning person, I have seen a lot of sunrises and all of them are very beautiful, but I am not lying when I say this one is definitely in my top 5. 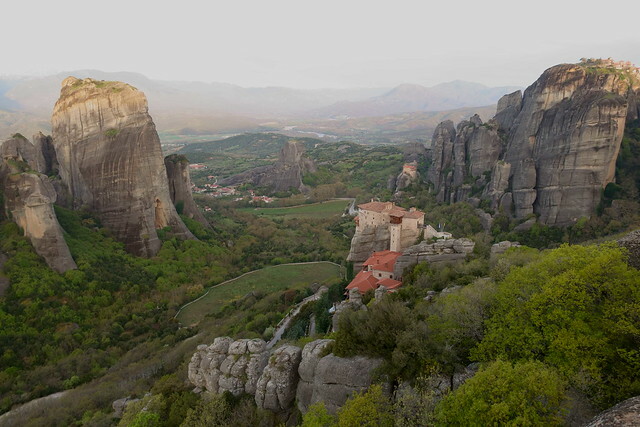 Planning a visit to Meteora, but you still have some questions? Please write me about it, I would love to help you and tell you about it!